As the enthusiasm for building canals gathered pace in the later part of the eighteenth century, various groups started putting forward proposals for canals to cross the barrier of the Pennines. Plans for the Leeds and Liverpool canal were launched in 1766. Just six weeks later a group of businessmen met in the Union Flag Inn in Rochdale to propose a shorter route between Manchester and Leeds via Rochdale. James Brindley was commissioned to survey two routes: one via Bury and one more directly via Heywood. However, nothing came from this original exploration. It wasn't until 1790 that a meeting was called in Hebden Bridge to discuss extending the Calder and Hebble Navigation westwards that momentum started to gather again. Another meeting took place the following year in Rochdale to propose a link right through to the Bridgewater Canal in Manchester. Most of the money raised to back this plan came from the Rochdale area. The group suffered setbacks when the Duke of Bridgewater refused to allow the proposed canal to join onto the Bridgewater Canal, meaning the canal would terminate at Piccadilly, and in 1792 the Rochdale Canal Bill failed. In the meantime, the Manchester, Bolton and Bury Canal Company proposed an extension eastwards which would have been known as the Bury and Sladen canal. This would run north of Rochdale to Chelburn near the Littleborough summit. The route considered from here would have involved a 4.8 mile tunnel taking a direct route towards Ripponden and Sowerby Bridge. The Manchester, Bolton and Bury company linked into the Mersey and Irwell Navigation and was also considering a link to the Leeds and Liverpool Canal. The Duke of Bridgewater realised that if the Sladen plan became a reality, the trans-Pennine traffic from Yorkshire would by-pass his canal with a great loss of potential revenue, so he changed his mind and agreed for a junction between the Rochdale and the Bridgewater at Castlefield. A revised Rochdale Canal Bill was passed in 1794 (the same year as the Huddersfield Canal Bill) and construction began. By 1799 the canal was open between Sowerby Bridge and Todmorden and from Manchester to Rochdale. A proposed 1.6 mile tunnel between Walsden and Sladen was replaced by more locks and a higher summit level at 600 feet. The resulting shorter summit level meant that many reservoirs were required to prevent the summit level drying up and to maintain an available supply of water for the 92 locks. The canal opened through to Manchester in 1804. This made it the first trans-Pennine canal route, as the Huddersfield, experiencing much difficulty in the Standedge Tunnel construction, did not open until 1811. The Leeds and Liverpool, with a much longer route, was not fully opened until 1816. In 1830 a railway surveyed by George Stephenson was proposed, following closely the route of the canal. When the Manchester and Leeds Railway opened in 1841, the canal company had to reduce tolls to retain business. The company resisted take-over bids from railway companies but leased the canal to a consortium of railway companies in 1855. The canal remained profitable for some time but by the twentieth century the tonnage being carried was in sharp decline. In 1937 the last boat made the through journey across the Pennines on the Rochdale Canal. In 1952, the canal was closed apart from the short section between Castlefield and the Ashton Canal junction at Piccadilly. The Ashton was abandoned in 1962 and by 1965 the nine locks on the Rochdale through Manchester city centre were almost unusable. 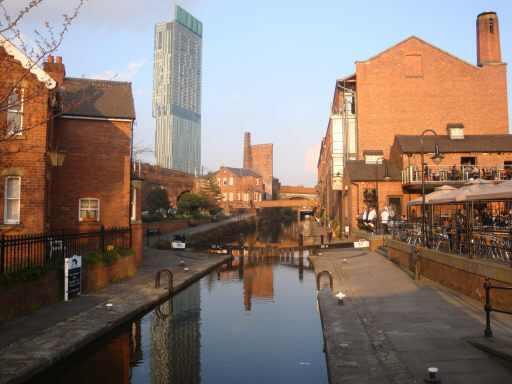 Enthusiastic supporters re-opened the Ashton in 1974 and the Rochdale Canal in Manchester was made good. The Rochdale Canal Society was formed to promote the restoration of the canal and in the 1980s and 1990s small scale work began to re-open stretches of the canal between Todmorden and Sowerby Bridge. This involved restoring bridges and locks to navigable condition. 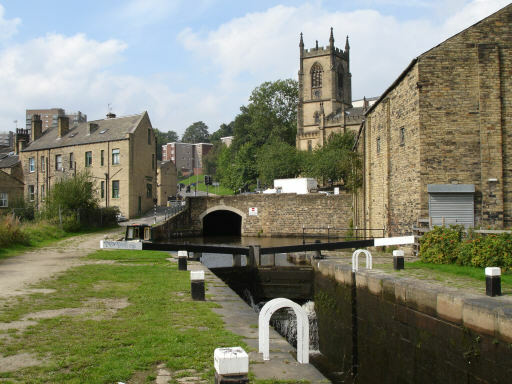 The most major project was the construction of the new Tuel Lane lock and tunnel in Sowerby Bridge. 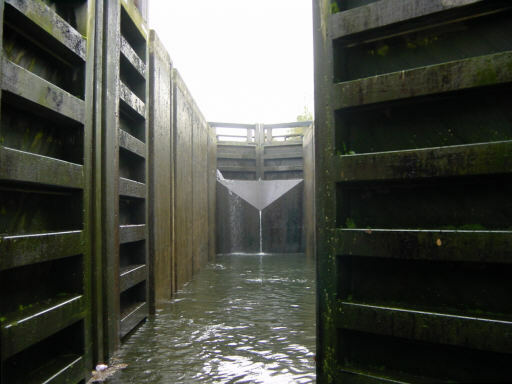 The lock replaced two locks in an infilled section and, with a fall of almost 20 feet, is the deepest lock on the inland waterways system. In 1996 the canal was opened to navigation once again between Sowerby Bridge and the summit level. When the M60 motorway was constructed through Chadderton, allowance was made for the canal and a new channel was constructed below the motorway construction. Unfortunately the same did not happen when the M62 was constructed right across the line of the canal at Castleton. The northern end of the A627M motorway and a traffic roundabout obstructed the canal a little further on near Queensway in Rochdale. The other major obstruction was the Co-op superstore in Failsworth, built right across the canal at towpath level. On the section between Littleborough and Manchester, a number of bridges had been made un-navigable, locks had been "cascaded" and some sections of the canal had been made shallow for safety. In 2000, the canal was transferred from the Rochdale Canal Company to the Waterways Trust. Funding of 23 million pounds was announced, mostly from the Millennium Commission and English Partnerships that would enable the remaining obstacles to be removed. In July 2002, the whole canal became navigable once again, almost 200 years after its original opening. Lock 92, Duke's Lock at Castlefield, Manchester.